Knight is developed on JoomShaper’s Helix 3 template framework. Our multi-tool & easy to use SP Page Builder Pro is included in the quickstart package which means greater visual customization and increases your site’s unique appeal. Knight is JoomShaper’s November 2016 template. 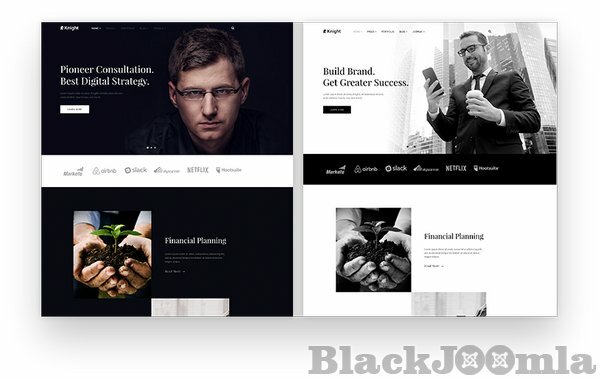 It’s a 100% responsive Joomla template for business and corporate houses with a special focus on marketing agencies, banking/non-banking financial institutions, insurance companies, brokers and such other entities looking to build their websites. The template can also be used by a team of professionals to launch a site presenting their skills and offerings. Let’s take a look at the core features of the Knight template. Knight is a multipurpose, beautiful, organized and lightweight template with every modern feature necessary to launch a business or corporate Joomla site in the shortest possible time. Building a site with Knight doesn’t require any coding knowledge. You can use the prepackaged industry-leading drag-and-drop tool SP Page Builder Pro to create a Joomla site in less than half an hour. Let’s check the detailed features below. The Knight template has 2 homepage variations to fit different people, different purposes and different tastes. For this template, we’ve chosen Black-and-White as the default visual scheme. The B/W variation has an eye-catching top slider, several featured areas, project slider, testimonials and a blog section. This variation shows Black-and-White images on the site even if you upload color images. It’s structurally identical to the B/W variation. The only difference is, the Dark variation shows color images (if you upload ones). We’ve developed dedicated addons to showcase your current projects and any other stuff presented as sliders. With the Project Slider addon, you can display your current or past projects via several slider frames. Users can navigate between them easily. Need a more legacy way to display your projects portfolio? The project gallery is the answer. It presents your projects in a grid layout. Visitors can click and expand single projects. Knight lets you tell your visitors about the projects you’ve completed and show them what your clients are saying about you. The portfolio addon displays a collection of your finished projects. It’s a handy way to keep the visitors informed about your great works. People with an amazing track record must have some testimonials worth sharing. Knight has a sliding Testimonial addon that enables you to do this perfectly. If you have an awesome team, then your business gonna perform great, and be featured in the media. Kight theme knows it and is prepared for this. The Team Gallery addon lets you introduce your team members to the visitors. When hovered on, each member’s grid image shows their social links. The featured slider is an awesome way to present the coverage of your business/entity by media and press. The Knight template supports RTL and translations. You can create a multilingual site with this. And it’s Retina ready. Knight lets you create a website in any language. The RTL feature means that you can launch a site having right to left (RTL) languages. Multilingual versions of a site can also be added. The ‘Retina-ready’ feature enables you to add higher quality images to your corporate site. This is very useful to keep the site consistent with modern standards. Email is an effective communication medium. You can easily stay in touch with your stakeholders via emails. Knight offers this facility with Acymailing. Acymailing component lets you acquire new email subscribers, create email lists, import/export lists, synchronize native Joomla user emails with its own generated lists, send newsletters etc. The email tool offers a range of readymade newsletter templates to send emails quickly. Also, you can compose new email templates if you want. Knight is built on our widely popular Helix 3 framework. This powerful Joomla template framework offers greater freedom to web developers and administrators. Helix 3 framework lets you build layouts easily on Joomla sites. It makes your site 100% responsive and mobile-ready. Build any layout you want and appear perfectly on any device. Helix 3 sports a range of tools to deal with the whole typography stuff of your Joomla site. Select a font family, customize typography styles, adjust font sizes and do more with ease. Our revolutionary content construction kit SP Page Builder’s Pro version is provided free with Knight. Use its drag-and-drop functionalities and save resources. With SP Page Builder, you can build or reorganize a Joomla site easily. No coding knowledge required. An amazing Joomla site can be launched in less than half an hour with SP Page Builder. SP Page Builder minimizes the time required to create web pages. It’s very fast. And the premium version comes free with Knight. It saves your time and budget in all ways! Knight is packed with all the latest standard technologies that ensure you will keep getting solid and seamless performance from the template. If you face any issue, we are here. JoomShaper has a long-standing track record of delivering regular product updates. If you ever feel that a fix is necessary for any of our products, please inform us via our support forum or contact page. We’ll get you back ASAP. We take this very seriously. We have a dedicated customer support team to ensure the best user experience. If you find any issue with Knight, just inform us via our support forums. We will respond soon.